Nut milk like almond and cashew milk are delicious vegan beverage options. 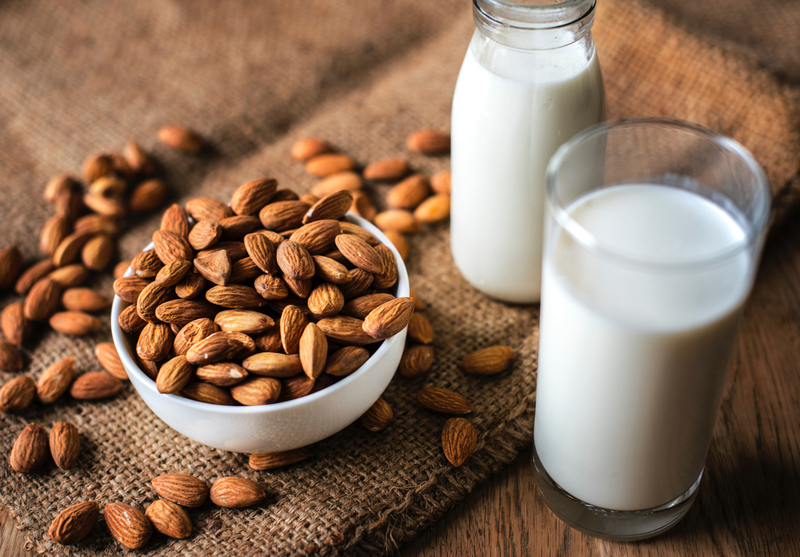 However, almonds and cashews are both tree nuts, which means that this type of milk can trigger allergies. Almond milk, however, tends to separate when poured and can make drinks appear watered-down. Cashew milk’s consistency is similar, but it tends to create less dense foam. Other increasingly common milk substitutes include macadamia milk and hazelnut milk. Soy milk, which is derived from soybeans, may sometimes be problematic for coffee shop customers because it is a common allergen. However, soy milk has a great creamy texture and good foaming, which is why it has been a popular choice at coffee shops for so long. Coconut milk is rapidly becoming a popular option in lieu of soy milk because of its flavor, texture, and density. Allergies to Coconut milk are rare, so it is often a viable alternative to soy. Rice milk is another popular substitution for coffee lovers, as its flavor is neutral enough not to alter the taste of coffee. In addition to being able to serve a larger variety of customers, adding non-dairy milk substitutes to your drinks can bring added flavor to your restaurant or cafe. Hemp seed milk, which is not a common allergen, is relatively hard to come by and is thus highly sought after. Hemp milk contains a trace amount of THC, which is best known as the psychoactive component of cannabis. The amount of THC, however, is very low and does not cause psychoactive effects. Oat milk is one of the newer vegan milk products on the market and has become very popular lately due to its great consistency when used in coffee beverages. Since oat milk is gluten-free and vegan, it is unlikely to cause any allergies or digestive issues for customers. When ordering non-dairy beverage supplies, consider Waterfall Gourmet Beverages. We provide a wide variety of wholesale coffee shop and restaurant beverages and supplies, including many of the vegan, allergen-free, and non-dairy milk products described above. Located in Central Texas and offers free delivery to customers in Waco, Austin, San Antonio, and surrounding areas. Waterfall Gourmet Beverages also ships nationwide.